Akechi Mitsuhide killed his master Nobunga and seized power in 1582. Nobunga’s army sought revenge for the death and so Mitsuhide sent his general Akashi Gidayū, shown here, to intercept the attack. However, Gidayū and his men were defeated, so he offered to commit 'seppuku', a ritual form of an honourable suicide for the warrior class. Mitsuhide did not want to lose his faithful retainer and refused. 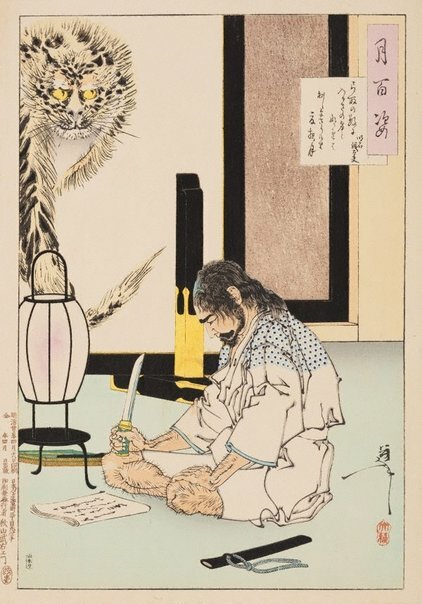 Gidayū disobeyed and is shown here with his writing implements carefully placed to one side, and the sword sheath on the other. He is focused on his death poem, which makes reference to the moon of a summer night, and prepares himself to perform the final act.